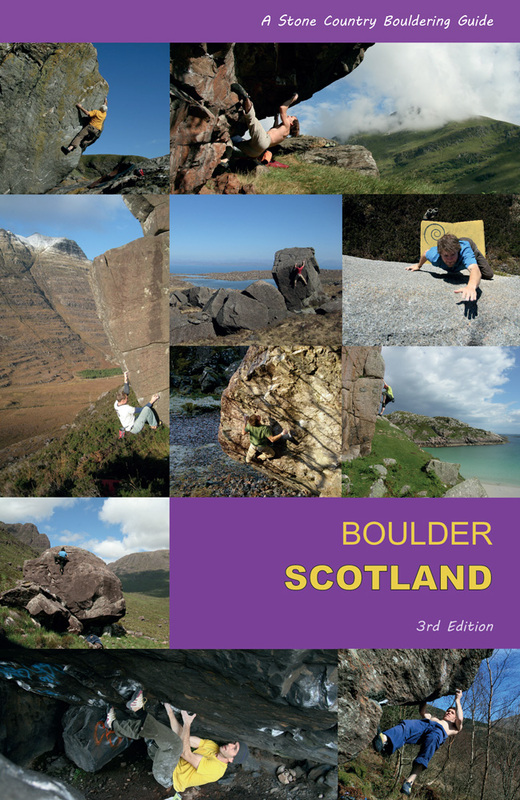 It's been a vigorous period of good conditions and boulderers around Scotland have profited from the dry spell now rapidly coming to a soggy close! 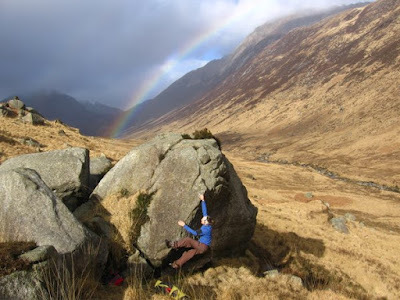 On Arran, Claire Youdale finished off the headwall of The Mushroom to give 'Invasive Species', a true and proper Font 6b+ finish to the Rock Lobster problem which jumped off at the jugs. Now only the big pocket project remains!! 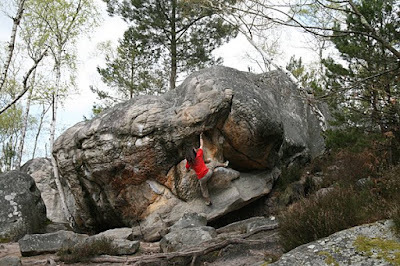 In the northwest, Ian Taylor repeated 'The Mission' and has been beavering at the problems on Ardmair Crag, completing the imaginative 'Ian's Problem' Font 6c, see the pic. The steeper walls here stay dry in light rain and have some good traverses and natural straight-ups. A topo will follow soon. 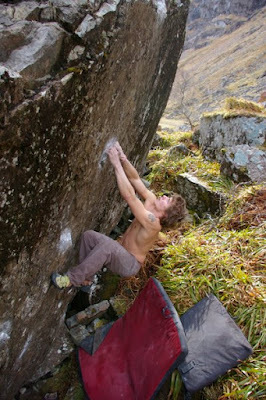 In Glen Nevis, Dave MacLeod has continued to develop the Pine Alps boulders, completing the true Bear Trap Prow at Font 8a+, hardest in the glen, Dave? He also did the attractive crack-line to the right of Waterfall arete, at 7b, which appears on his blog in an amusingly constructed video. 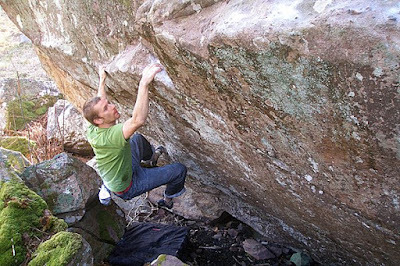 He also did a direct to the 'Dude' problem at Ruthven, at about 7b, with a hangover (Dave!). 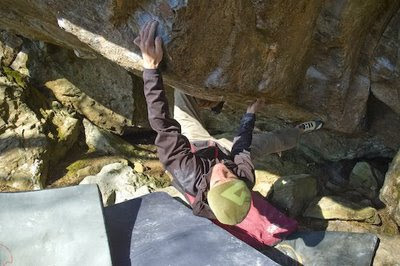 At Dumby, Stewart Brown and Niall McNair repeated Pongo Sit with a new 'Australian' grip on the crux hold, which brings the grade down if you can manage the handhold. 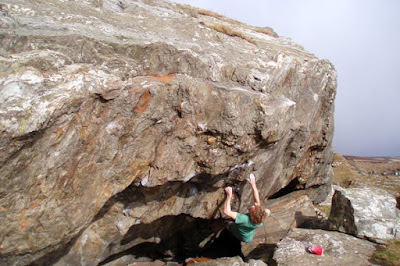 It was discovered by Tom Charles-Edwards' Australian friend, who thought all our 'Scottish' methods unnecessarily brutal and proceeded to knuckle-jam the niche and do the first crux move entirely static! 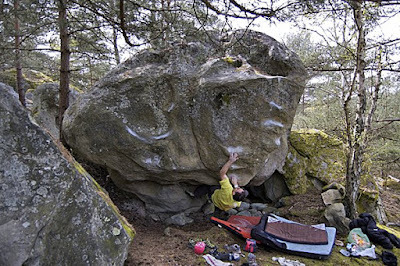 Ben Litster returned from Magic Wood, uber-psyched and went straight up to the Lost Valley, climbing a good looking 7c wall called 'The Grass is Greener', just up and right from the leaning bloc. He also repeated King Kong at Dumby, a reward for a lot of hard graft, well done!! Luke Fairweather completed his project Twilight Princess 8a+ (Kayla linked to Pit Left Hand) and repeated some new classics such as Shameless 7c and Optimus Prime 7c. 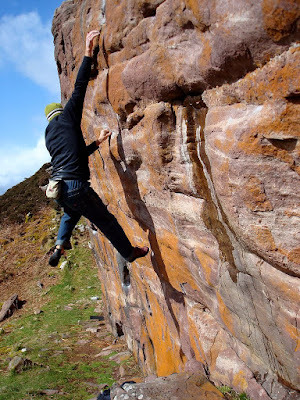 At Torridon, Richie Betts climbed the wee cave wall behind the Ship on the left, reminiscent of a miniature 'Dreamtime' he called it 'Snoozetime', it's not quite as hard as its Swiss muse, but a good 6c+ he thinks. Everyone knows the gravity is heavier in the forest.... 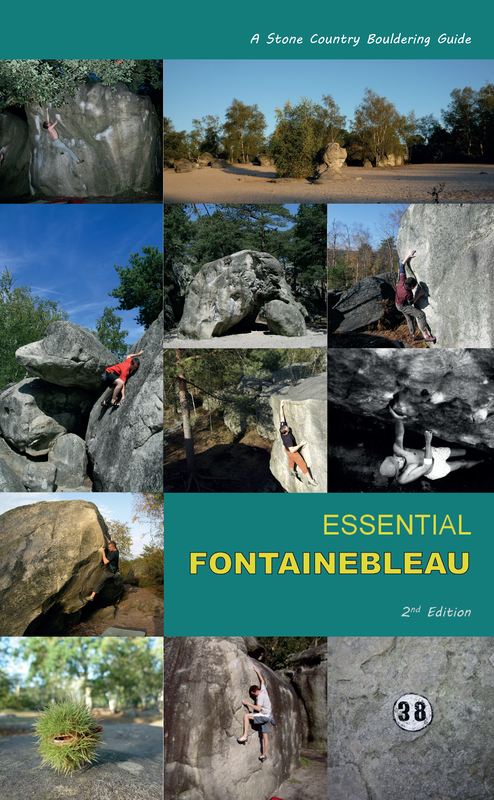 I took a research trip to Fontainebleau to 'climb lighter' and collect my thoughts for the next bouldering book, before we launch into a few Scottish trad books from Stone Country Press. 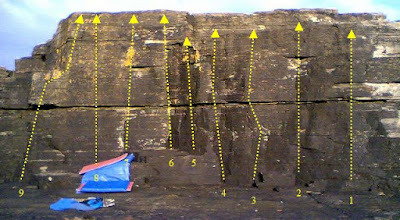 The finest quality to bouldering in my opinion is its flexibility and this is well worth exploiting in an area as diverse and huge as Fontainebleau, you can search for varying styles of climbing, even changing them on the same boulder within seconds - should you find your crimping strength is weak but your core tension is good, drop the sharp marble-edged walls and climb into the depths of a slopey roof! Or vice versa... Font is a place of pure experimentation and allows you the luxury of trying your new formulae with no more than the fear that you're popping placebos, it's all in the mind anyway... just move on if nothing happens, that's the philosophy of the forest! Thousands and thousands of these little experiments provided a few choice 'cures' to Font gravity and a new problem or two. 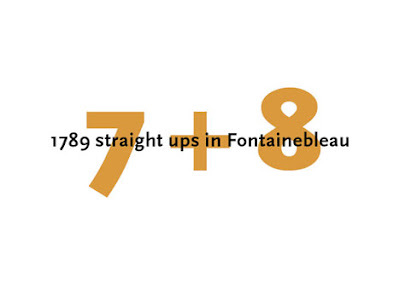 The new guide '1789' Straight-Ups in Fontainebleau (a significant number in France!) is a work of genius, pulling together complexity into a clear and logical layout, with a simple and elegant design, allowing the climber the time just to climb! The maps are all cross-referenced and super-accurate, it's a lifetime's reflection of a love of the forest from Bart van Raaij - the book simply became known as 'Bart' on the trip, we passed 'Bart' from hand to hand, threw it on the ground a thousand times, drove over it, spilt espresso on it, sat on the bog with it with dirty hands, hit slobbery dogs with it, used it as a sun-shield, rain-hat, left it out in the dew... and it is still in one piece, so the production standards are pretty rugged. As I said, a work of genius, if you are operating at 7a or over. And did my own experimentation work? A little, I notched off one more point of gravity on my very slidey scale, proving that nothing comes easy in Font... I'd say a grade a year if you are lucky! !